Our Child Life Specialists help take the scary out of a hospital stay! Sunrise Children's Hospital features the state's most comprehensive Level III Neonatal Intensive Care Unit (NICU). Sunrise Children’s Hospital is the largest and most comprehensive children’s hospital in Nevada. When our doctors, nurses, parents, and others come together, we can make amazing things happen for the children of Nevada. That’s what we mean by “Amazing Together”- Working together to provide expert care for infants, children, adolescents and expectant mothers in our community, the surrounding region and the millions of visitors that come to Las Vegas. 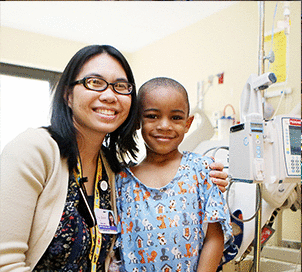 Our commitment to amazing care begins with providing a full range of services designed especially for kids, from our dedicated pediatric emergency room and inpatient unit to our pediatric heart surgery program. We have the largest Level III Neonatal Intensive Care Unit (NICU) and Pediatric Intensive Care Unit (PICU) in the state. Located on the same campus as Sunrise Hospital & Medical Center, Sunrise Children’s Hospital believes that with you, we are Amazing Together. Pectus excavatum, also known as sunken chest, is a depression in the chest wall. How should I prepare my child for surgery? Parents can help prepare their child for surgery by honestly discussing their condition and procedure. What kinds of weight loss surgeries are appropriate for teens? The most common procedure performed in children and adults for weight loss surgery is laparoscopic sleeve surgery. Learn more from Michael Scheidler, MD, with Sunrise Children's Hospital. How does childhood obesity affect liver health? Why should I go to the ER for an orthopedic injury? Why are ACL injuries more prevalent in football and soccer? What causes pain while running? When should my child wear a brace while playing sports? Are ACL injuries more common in males or females? How can my child prevent shoulder overuse injuries from baseball? What happens if my child fractures the growth plate? Why may I need ACL surgery? Whether or not someone may need ACL surgery depends on the patient’s function and the stability of their knee. Watch Jason Nielson, MD, of Sunrise Children’s Hospital, explain more. How can I help to protect my children from sports injuries?